The VALIDIKEY 20 Vault can function as a standalone system, or it can be scalable, meaning numerous vaults can communicate within a single CyberAudit® Enterprise system. 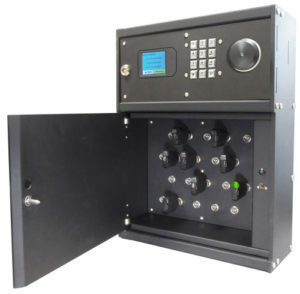 The VALIDIKEY 20 Vault reads the ID of most unencrypted 13.56 MHz RFID cards, secures 20 CyberKeys, supports Generation 2 Keys, and recharges Keys while in the vault. The front of the vault contains an RFID reader with an indicator light, a keypad, and an LCD touch screen that displays status.